C. Two-body, polished and brushed, bezel with 5 screws inserted with brilliant cut diamonds, concave lugs, protected crown, case back with 4 screws, sapphire crystal. D. Mother of pearl, applied diamond indexes, luminous dots, subsidiary dials for the seconds, 1/10th seconds and 12 hour registers, outer minute division, aperture for the date. Luminous steel baton hands. M. With quartz standardization. Dial, case and movement signed. Diam. 40 mm. Thickness 11.5 mm. 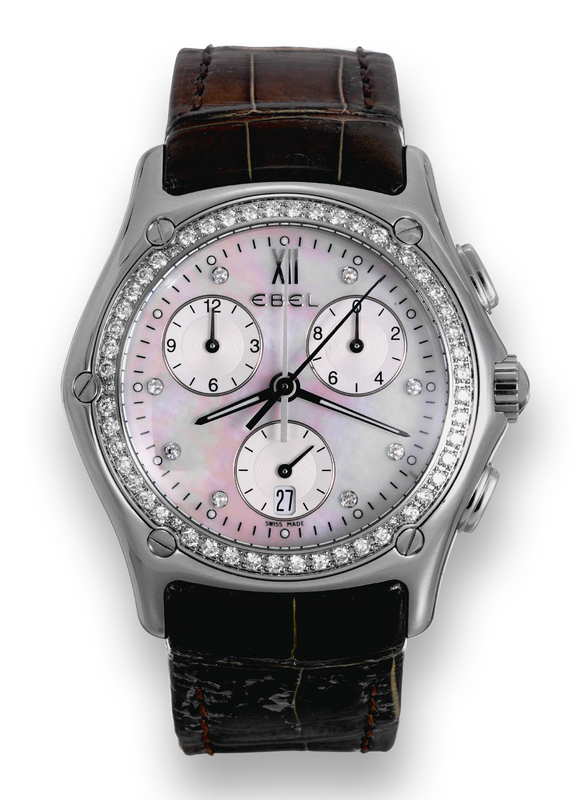 C. Two-body, polished and brushed, bezel with 5 screws inserted with brilliant cut diamonds, concave lugs, protected crown, case back with 4 screws, sapphire crystal. D. Mother of pearl, applied diamond indexes, luminous dots, subsidiary dials for the seconds, 1/10th seconds and 12 hour registers, outer minute division, aperture for the date. Luminous steel baton hands. M. With quartz standardization. Dial, case and movement signed. Diam. 40 mm. Thickness 11.5 mm.